One of our favorite late night stops. After a disappointing evening watching Tango Buenos Aires at The Long Center, we needed a pick-me-up meal. There are usually a bunch of people eating at Justine's at around 10:30pm so it doesn't feel like your the only patrons left in a restaurant and the food is pretty good. Salade d'Endives Poire Roquefort Belgian endive, pear and roquefort salad with walnuts, butter lettuce, and a classic vinaigrette, $8. 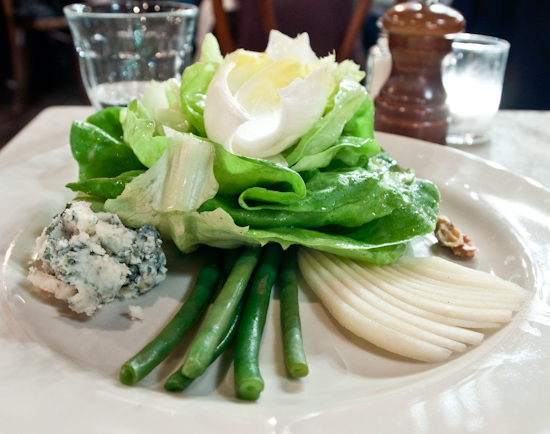 The Salade Landaise salad is stellar at Justine's, but this endive, lettuce, and bleu cheese salad is pretty decent. Aspèrges Grillées, $6. 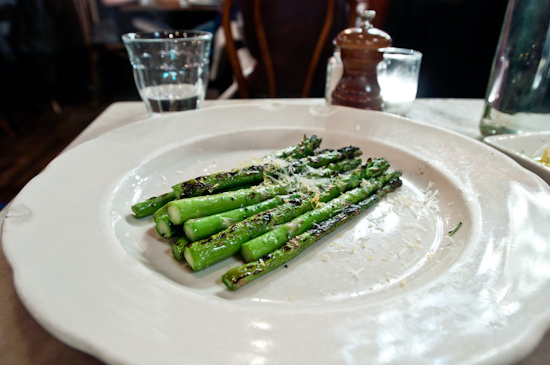 A smaller portion of grilled asparagus than we expected, but it was okay since the entrees filled us up. 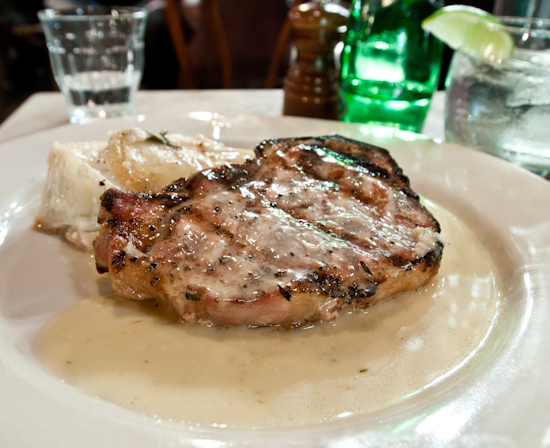 Côte de Porc pork chop grilled with a thyme reduction served with potatoes au gratin, $16. Although the pork chop was a bit overcooked (not as tender and juicy as it could have been), it had so much flavor that Tina (who is typically very critical of pork) loved it. Duck special (roasted duck breast with buttery cauliflower), $22. 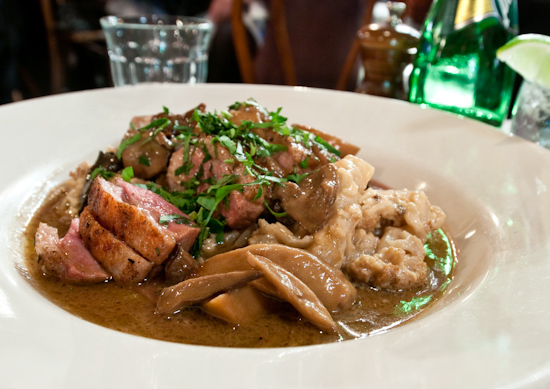 Tender and flavorful duck with an even more amazingly flavorful preparation of cauliflower and mushrooms. The sauce was so good I asked for extra bread to sop it up.